This is true of the current spat between Thailand and Cambodia over the 4.6 sq km area of land around Preah Vihear Temple that is claimed by the both countries. The only difference is that the dispute began with armed clashes on Feb 4, followed by talks and a collapsed truce, with both sides trading accusations as to who broke the truce first. Their armed forces, led by Thai army Chief-of-Staff Gen Dapong Rattanasuwan and Cambodia's deputy army chief Maj Gen Hun Manet, made a gentlemen's agreement at a meeting at Sa-ngam Pass in Si Sa Ket on Feb 19. But since then peace has yet to return permanently to this part of the border. The meeting led to the end of attacks with heavy weaponry, but the sounds of rifle and grenade fire have been heard sporadically almost every day, in the strategic location of Phu Ma Khua to the west of the Hindu temple. The Thai army claims the Cambodian troops tried to seize control of the hill and had no choice but to counter the raid. Cambodia argues that its soldiers were hit first by Thai grenades and had to fight back. The latest tense situation took place on March 4, when Thai soldiers resumed construction of a road and bridge. 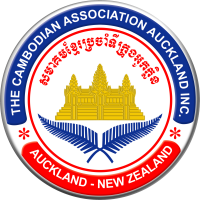 Cambodian troops have made clear that they are ready to fight if the road project goes to Keo Sikha Kiri Savara pagoda. As the defence ministers and top military leaders of the two countries will be at the same table at the General Border Committee meeting in Bogor, Indonesia on March 24-25, nobody wants to do anything to spoil the atmosphere. Lt Gen Thawatchai Samutsakhon of the Second Army Region ordered his soldiers to use a new approach to deal with their Cambodian counterparts. Thus, last Saturday a volleyball match was held at Ta Thao Pass near Preah Vihear to foster ties. It was not a match between Thailand and Cambodia, as both Thai and Cambodian soldiers were in both teams on the court, to underscore a sense of unity. After the game, the soldiers and local leaders enjoyed a hearty luncheon together, with food prepared by both sides. "Cambodian soldiers said they killed two cows to prepare this meal, showing their appreciation for this occasion," said a Thai soldier at the event. For the Thai side, all leaders of tambon administration organisations, district office and schools in the area were invited to take part. On the field, this day of friendship was organised by Col Wutti Saengchak, deputy commander of the Suranaree Task Force who is the right-hand man of Lt Gen Thawatchai. The colonel worked with Lt Gen Prom Peng, who is in charge of Ta Thao Pass in Cambodia. The two main organisers ordered a company of troops from each side to meet for the first time since the fighting. Visiting Cambodian troops told Thai soldiers that they had been ordered to drink not more than two cans of beer at most. But it turned out to be a non-stop "happy hour", starting with the volleyball at 9am followed by lunch and drinks till 2pm. This enemy-turned-friend event lasted a lot longer than two cans of beer, with round after round of cheers and resounding applause, as the Thai side had made sure there would be an almost limitless supply of beer. 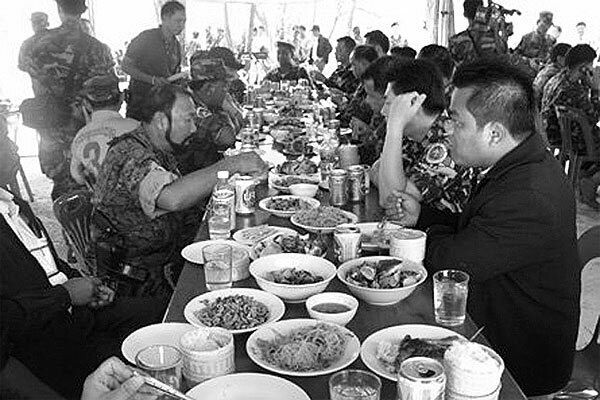 To show their good faith and sincerity, the Thai soldiers showed no hesitation in eating the beef brought by the Cambodian troops. Under normal circumstances, Thai soldiers will refrain from accepting food or water from the Cambodians for fear of the infamous Cambodian "black magic". The drinks led to the "confession" from many Cambodian soldiers that they did not want to fight Thai soldiers but had no choice because they were under orders from Prime Minister Hun Sen, who is Maj Gen Hun Manet's father. - The commander of the respective militaries will strictly control their soldiers based at the border, to make sure that there will be no more gunfire. Any badly behaved soldier will be immediately moved out and away from the frontline. - They will not build new structures and stop the existing project. For the Thai side, this means shelving the road project to Keo Sikha Kiri Savara pagoda. - The respective commanders will immediately use the hotline if any conflict takes place at the border, to prevent it from escalating. - The soldiers will continue to nurture an atmosphere of friendship to ease border tensions ahead of GBC meetings, including the one at Phu Ma Khua. The Thai side is confident the situation will ease ahead of the GBC meeting between Thai and Cambodian defence ministers, Prawit Wongsuwon and Teah Banh, who will thrash out details regarding the Indonesian observers to be sent to the border. Frankly, Thai military leaders are not happy that the GBC has.